Every year in January while north India welcome its first festival of Makar Sankranti, also spread happiness of Lohri and Pongal. It is the most joyous season. Read more about Makar Sankranti, Lohri, and Pongal. In Sankranti usually, a combination of til/sesame and jaggery is consumed with kite flying. In Lohri, it all related to bhangra/giddha, bonfire and revri/popcorn. 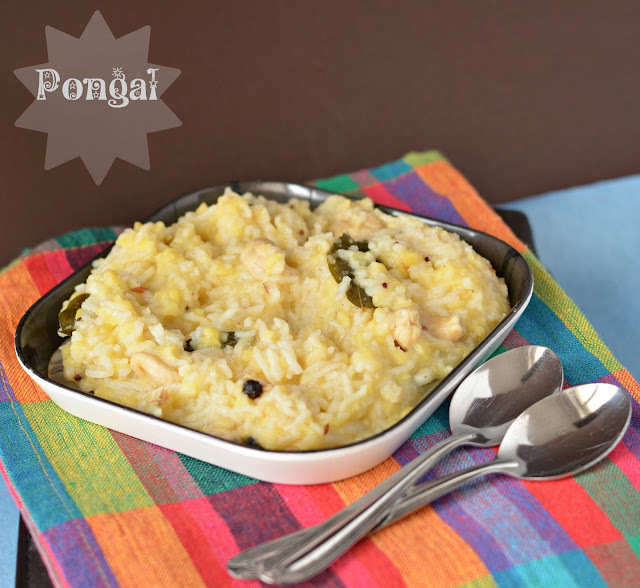 In Pongal, we make a recipe with the same name as Pongal. Today I am sharing this savory recipe with you all. Pongal tastes yummy and good for the stomach. In north India, we call it khichdi only but in Bangalore, I got to know it as Khara Pongal. Initially, I did not taste in hotels due to the difference in cooking style. I am always scared to try something new if there is a change in cooking method. The only difference is mustard seeds & curry leaves. Rest ingredients are same as we make khichdi. One more point in Pongal always use ghee, wow what a taste when it is made using ghee. Well, ghee is something which never gets a place in my kitchen. Until I realized after my second baby how important it is to eat 2-3tsp ghee every day. Yummmmmmmmmmmmmy taste :). My daughter loved eating it. And I had two times back to back. Could not resist me for overeating. Ingredients are not very specific, I have made this final list after trying many combinations :)). And this is what I like to make :D.
Pongal is cooked on the occasion of Pongal festival. Read more about Pongal here. Method: Soak dal and rice for half an hour. Heat ghee in a pan and add cumin seeds & mustard seeds. When they start crackling add slit green chilies, curry leaves, crushed peppercorns & ginger paste. Fry for a minute and then add turmeric powder & salt. To this add soaked dal and rice and stir it for a minute. Add 2.5 cup of water and cover it with the lid. If you want more watery than add more water accordingly. Once it is completely cooked garnish it with chopped coriander leaves & lemon juice and serve hot with pickle or curd. I think there is one more variety of Pongal where sweetener is added. I don't like sweet rice except for kheer so not going to try. "This Pongal" recipe is contributed to 40 Healthy Wellthy Cuisines where the theme is 'Makar Sankranti'. Date palm jaggery rice pudding/ khajur gud Kheer / Nolen gurer payesh From Rosy. Every year in January while north India welcome its first festival of Makar Sankranti, also spread happiness of Lohri and Pongal. It is the most joyous season. In Sankranti usually, a combination of til/sesame and jaggery is consumed with kite flying. In Lohri, it all related to bhangra/giddha, bonfire and revri/popcorn. In Pongal, we make a recipe with the same name as Pongal. Today I am sharing this savory recipe with you all. 1) Soak dal and rice for half an hour.2) Heat ghee in a pan and add cumin seeds & mustard seeds. 3) When they start crackling add slit green chilies, curry leaves, crushed peppercorns & ginger paste.4) Fry for a minute and then add turmeric powder & salt.5) To this add soaked dal and rice and stir it for a minute. Add 2.5 cup of water and cover it with the lid.6) If you want more watery than add more water accordingly. Once it is completely cooked garnish it with chopped coriander leaves & lemon juice and serve hot with pickle or curd.